Radiographs (x-rays) are an important diagnostic tool used by veterinarians. We use x-rays to help identify the cause of an animal’s illness, rule out possible problems or provide a list of possible causes. We also use x-rays during wellness examinations to diagnose issues before they become serious, such as hip dysplasia or even the number of fetuses in a pregnant animal. X-rays provide valuable information about a pet’s bones, gastrointestinal tract (esophagus, stomach, small intestine and colon), respiratory tract (trachea & lungs), heart, genitourinary system (bladder, prostate), kidneys, liver, spleen and other important organs. We can use radiology alone or in conjunction with other diagnostic tools. 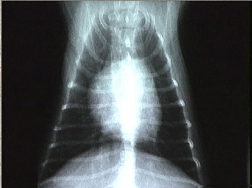 Interpretation of radiographs requires great skill and knowledge on the part of the veterinarian. At South Windsor Animal Hospital, we are able to take dental x-rays as well. This allows our veterinarians to visualize what is occurring beneath the gum line, recognize areas of concern such as abscesses (infections), root problems, missing teeth, along with a variety of other conditions. To avoid blurry x-rays, we need our patients to remain very still while the x-ray is taken. In some cases, we may need to sedate your pet or use short-acting general anesthesia. In any case, we would always discuss this with the client prior to using any sedation or anesthetic medications. If you have any questions about our radiology service, or what to expect during your pet’s procedure, please do not hesitate to ask.